who have combined their talents to create amazing treats with an innovative twist. Cheesecakes and cheesecake cupcakes in a variety of whimsical flavors—Cup o’ Cappuccino, Brownie Delight, & Apple Cinnamon Sensation—are their specialty. To give you an idea of how wonderful they are, the Brownie Delight features a dark chocolate crust with luscious brownie bits baked into the batter with a topping of brownie chunks, fudge and a white chocolate drizzle. Need I say more?! 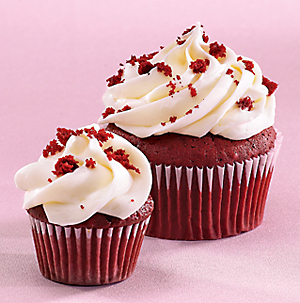 Other desserts include cupcakes in fun flavors such as Bubble Gum and Cotton Candy, as well traditional favorites such as Red Velvet (pictured below). The shoppe also offers an Indulgence of the Week, and proceeds from its sales are donated to charity. Now that’s a guilt-free dessert! Gwynn has an extensive culinary background and is currently test kitchen director for Woman’s World Magazine. Bryan has a marketing and PR background specializing in food accounts. As a food stylist, I have worked with Gwynn for many years and I can say first-hand (or should I say first bite) that this team’s “sweet indulgences” are not to be missed! If you are in the NY/NJ area, you can visit Gwynn and Bryan’s shoppe at 120B West Shore Ave. in Dumont, New Jersey (201) 384-CAKE. You may also visit them on the web at SweetIndulgencesNJ.com or become a fan of Sweet Indulgences on their Facebook page at http://www.facebook/SweetindulgencesNJ. oh.my.gosh. my mouth is watering!! will add this to my “to bake” list!! Seriously, the cupcake craze continues…. p.s. We LOVE the angel cookies on Crustabakes. CUTE! 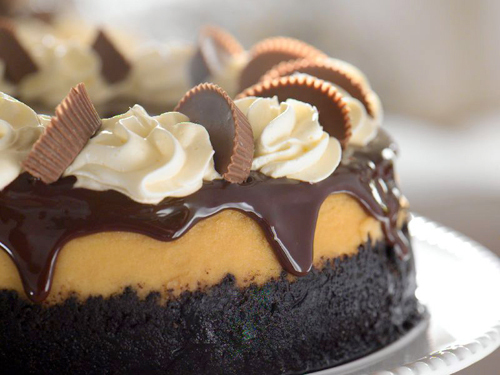 Oh my – that is one beautiful cheesecake! Thanks Dara! We LOVE your Turkey gravy post with your beautiful photos on CookinCanuck! Gravy can be a challenge both to make and to shoot! We agree. Who’s in the mood for pumpkin pie when you can eat chocolate cheesecake??? Wow, that’s a good looking cheesecake.